India's Disappearing Railways is a vibrant photo-essay by Australian photographer Angus McDonald, capturing for the first time in print the sub-continent's unique narrow-gauge railways in all their vivid colour, character and chaos. Published posthumously and edited by his widow Catherine Anderson, it is an intimate and humorous portrait of life on the trains, evoking the very soul of India. With a rare empathy and insight this stunning photo-essay illustrates the lives of those who ride India's railways, who work on them, and who live alongside them. Yet as the nation modernises these railways - whether in the snow-peaked Himalaya, the terai of Rajasthan or the verdant Nilgiri Hills of Tamil Nadu - are vanishing. India's Disappearing Railways records a way of life that is slowly disappearing and documents the diversity of this vast and multi-layered country from a unique standpoint. All author proceeds go to The Angus McDonald Trust. To order India’s Disappearing Railways, visit Amazon UK's store, here, or the publisher's website directly, here. 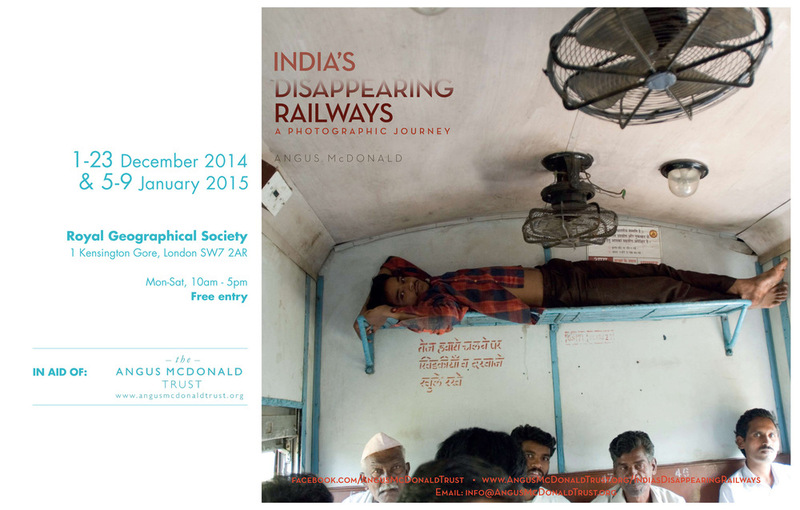 Angus’s last major project the vivid photo-essay India’s Disappearing Railways was published in November 2014 and was accompanied by an exhibition at London’s Royal Geographical Society in December 2014/January 2015. The exhibition will move to the Customs House in Sydney and fortyfivedownstairs in Melbourne in the Winter of 2015-16. Information regarding the Australian exhibitions will follow soon. Sign up to our newsletter for updates. All author proceeds from both book and exhibition go directly to The Angus McDonald Trust.